Happy 1st Anniversary! Beginning Montessori Giveaway! We’ve just about reached the end of our 1st Anniversary of Blogging Celebration. It has been such a joy to share with you our favourite Montessori resources and products. It has been a lot of fun reading your responses as you explore Montessori further. And our readership continues to grow! Thank you for following our blog! Thank you for sharing our blog with others! If you haven’t already done so, don’t forget to enter to win a signed copy of The Joyful Child up on our blog until Tuesday, September 16 at 11:59PST. Amongst other materials which you can check out on our website. Since we’ve observed our daughter A. use these toys, we’ve tweaked a couple of them but most were already perfect. It has been such a joy for me to see A. use these materials! It has been such a joy for me to see all of the Montessori Moms babies use these toys! (From top to bottom you can see Christie’s sons R. and P.. my daughter A. with the interlocking discs, and Tomoko’s daughters M. and E.) It continues to be such a joy for me to see many, many babies enjoy these toys. I know at a deeper level how much the child is gaining through their usage of these toys so it just delights me! You can read a short description of each material on the website and in addition, each toy comes with a product card describing the purpose and usage of each toy. If you’re looking for cleaning information, please check our facebook page note on cleaning our materials. This Five Pack of Montessori Baby Toys was designed to be a perfect baby shower or first gift for the child. The cost of the five pack is $48 and the giveaway includes free, international shipping. A few of the toys can start to be enjoyed within the first months of the child’s life. They will aid the child’s development, and continue to be enjoyed, throughout the child’s first year. These toys will also last for multiple children and in infant communities. They are great quality and beautifully made. They make great teething toys and you can be sure they are safe to be mouthed on by an infant as they are hand-made with natural materials. We hope you will enjoy them as much as we do! The giveaway will close on Monday, September 22 at 11:59PST. Winner must respond within 48 hours of being contacted. Good luck! The giveaway is now closed. 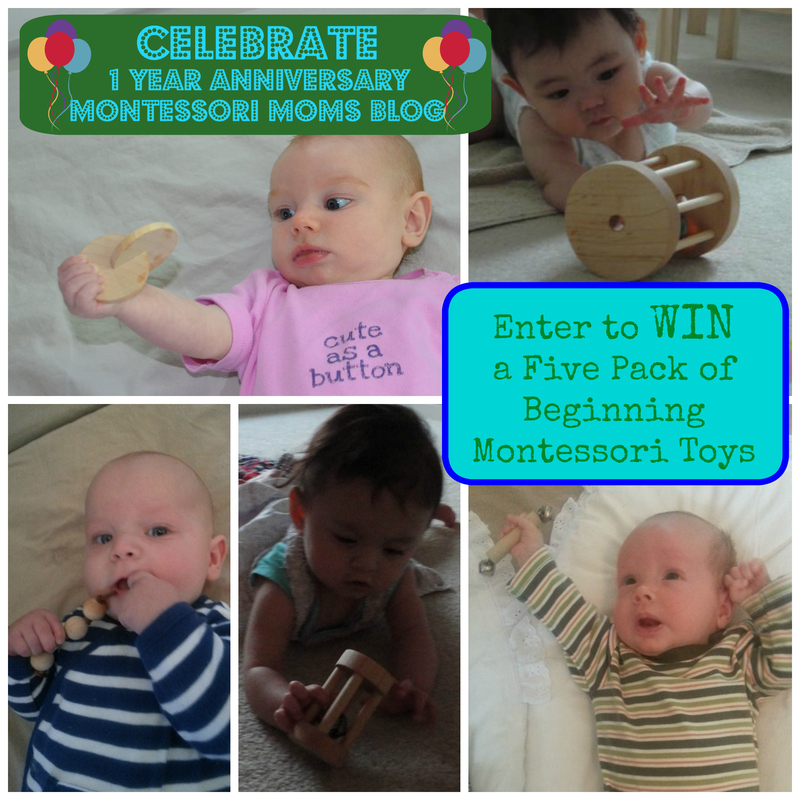 Congratulations to Crystal G. on winning the 5 Pack of Beginning Montessori Toys!